When you come to The Range, and make your way past the fully stocked retail shop area, you will be greeted by our truly state of the art shooting range. We currently have 12 lanes total, 6 Standard Lanes, and 6 Premium Lanes. Our range is open to the public, though members do get incredible discounts and perks. 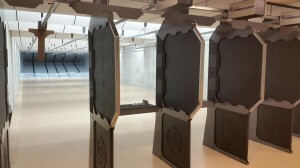 Both our Standard and Premium Lanes will leave you breathless in comparison to a typical indoor shooting range; and when we say breathless that isn’t a pun. Our state of the art air ventilation system cycles the air every 60 seconds. The air turn-over is just one of the many advancements The Range of Richfield’s facility has over other ranges. Below is a breakdown of features. • ONLY LEAD OR LEAD WITH COPPER JACKET BULLETS WILL BE ALLOWED AT THE RANGE. • BRASS AND/OR METAL CASED AMMUNITION IS APPROVED. Note: All standard pistol/handgun and rifle calibers are acceptable to use at The Range of Richfield. No need for frangible rifle rounds. Though our range can handle up to 500 S&W handguns, we will only be allowing extra large rifle calibers on lanes 1-6. Only Shotgun single projectilce slugs are allowed, No Birdshot, No BBs, No Home Defense Rounds, including no 410 Handguns. 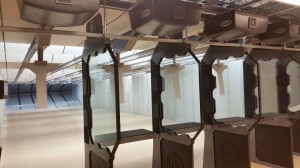 Both the general public and members can reserve lanes at The Range. Members can reserve a lane up to 7 days in advance and non-members have to call the same day to reserve their lane. You must call (262) 674-1550 during business hours. Email, text, and voice mail reservations are NOT accepted. Lane reservations will be void TEN Minutes after reservation time. If you make a reservation KEEP IT, if your plans change please call to cancel your reservations. So what are you waiting for? Reserve a lane and come enjoy the Ultimate Shooting Experience! All non-profits and fundraiser event holders must fill out a donation request and either mail or drop off the completed form to be considered.